Triplichol provides a comprehensive formulation of ingredients like Orthomega Select DHA, Plant Sterols, Time Release Niacin, and protective antioxidants to help maintain cardiovascular health. Cardiovascular health is a leading concern for many adults. It is a complex system that involves many different organs including the heart and blood vessels. It also involves key indicators of cardiovascular function, including blood lipids (cholesterol and triglyceride levels), blood pressure, circulation, cardiovascular inflammation, heart rhythm, and arterial function. The complexity of this system requires a strategy that can address all of these key areas of cardiovascular health simultaneously. Triplichol provides a comprehensive, “smart” combination of well researched ingredients to support healthy blood lipids, maintain normal blood pressure levels, and provide antioxidant protection for healthy blood vessel function. 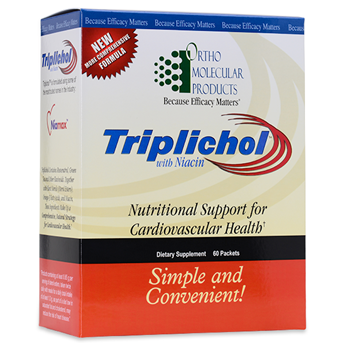 Triplichol is a targeted combination of four high-concentration formulas specifically designed to support three key areas of cardiovascular health: blood lipids, blood pressure levels, and healthy arterial function. Each convenient, easy-to-take packet includes: Time-Release Niacin, which provides controlled-release vitamin B3, the most effective and versatile nutrient for supporting healthy cholesterol levels and promotes the production of healthy high-density lipoprotein cholesterol (HDL-C). Orthomega Select DHA, which includes a powerful, 5:1 docosahexanoic acid (DHA) to eicosapentaenoic acid (EPA) fish oil concentrate delivering 580mg of DHA, the specific component of fish oil proven to maintain healthy triglyceride levels, balance blood pressure within normal ranges, and improve circulation. Plant Sterols, which provide 1,300 mg of phytosterols shown to limit the absorption of dietary cholesterol and balance blood cholesterol levels within normal ranges. The Phytonutrient Antioxidant Capsule includes resveratrol, red wine concentrate, green tea extract and quercetin, a potent antioxidant blend shown to decrease cholesterol oxidation and protect arterial function.